Some days I am in the groove sitting snugly in my little boat rocking over the waves. I feel like I’ve finally arrived in a routine and rhythm that works. Without fail, I begin to believe that this is the way things will continue to go and that rough waters are behind me. Then the wind changes, the moment passes, a different day brings new and old challenges back to the surface. Early on as a parent I told myself to enjoy the good because it might be fleeting and to know that the hard parts will pass eventually and I learn this over and over again. Even if I haven’t arrived in precisely the right place or settled into the perfect routine, I am finding myself in the flow of life riding the waves as they come, trying to make the best of it or let it go. As January nears its end, I’ve reflected a bit more on the goals and wishes that I dreamed up when the year was brand new. What I can be sure of for 2016 is that it will bring big changes (as we welcome and adjust to a new family member) and also much of the same. No matter what, I am fairly certain that this year will be more about growing as a family than anything else. I was recently reminded that the most important thing is to enjoy the journey and I resolve to do the best I can at that. One of the more practical challenges I have set for myself this year is to do all I can to waste less. There are so many ways to approach this, but the one I am especially interested in is not so much waste less as make best use of. I want to get better at using every bit that I can before considering throwing something away (or composting, donating, or recycling, of course). I started with citrus. First I dumped a pile of orange and grapefruit peels and rinds into a jar, covered it with white vinegar and let it sit for a few weeks. Once the vinegar is strained from the citrus, it makes for a sweet smelling cleaning vinegar. I used mine to scrub and freshen the drains in my kitchen sink. You can also turn citrus peels into candy. Before I sliced subsequent grapefruits open to devour the juicy, sweet tart fruit inside, I grated off the zest. This is a quick and easy way to get a little more out of any citrus before your peel or juice it. The zest could be mixed with sugar to make a grapefruit scented sweetener or used in a citrus salt. Store zest in the freezer for future use or save it in a jar in the fridge for a few days, as I did, before making it into a grapefruit olive oil cake. 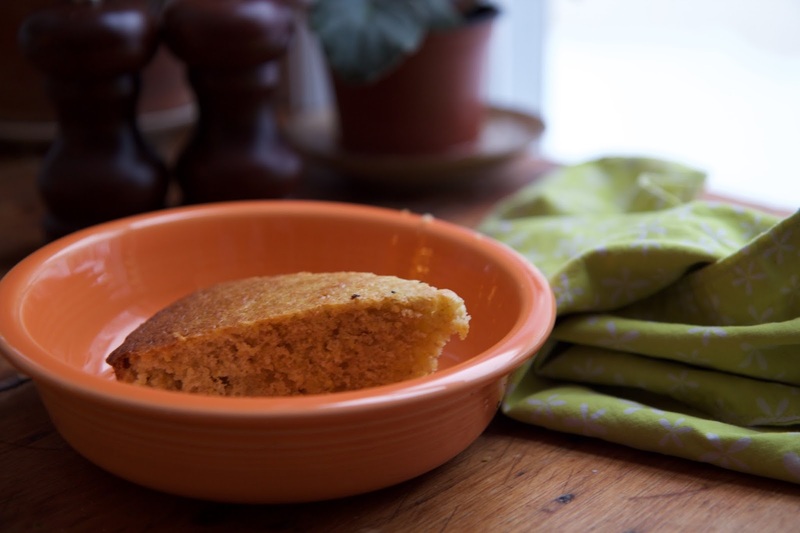 It seems fitting that this simple cake is made with scraps that could easily be tossed aside, unused. It is perfect for any and every day and needs to embellishment and no special excuse to bake or eat. Adapted from Good to the Grain by Kim Boyce. I love the original version of this cake but I knew it would be excellent combined with citrus as well. 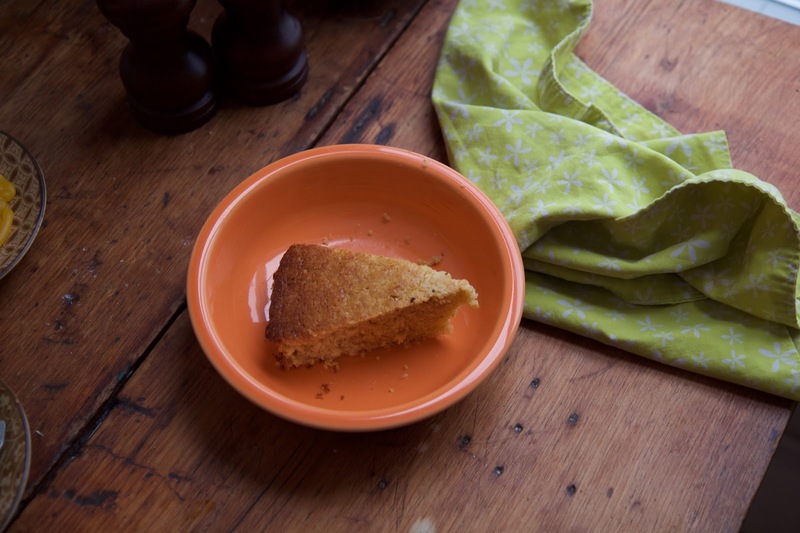 I used a lot of zest in this cake since I had eaten a few grapefruits during the week, if you use less the flavor will be more mild. If you prefer to zest your fruit all at once, make sure that you use the zested fruit sooner since it has less skin to protect it from drying out or spoiling. If you don’t have grapefruit zest, orange or lemon zest would also be excellent. Preheat the oven to 350 degrees F. Rub a 9/12 inch fluted tart pan or cake pan with olive oil. Whisk together flours, cornmeal, sugar, baking powder and salt. In a separate bowl beat the eggs, olive oil, milk and zest. Pour the wet ingredients into the dry and stir until combined. Pour into the prepared pan and bake for about 40 minutes until deeply golden brown and a skewer inserted into the center comes out clean. Serve warm or at room temperature. It will keep for a few days. That is good tip about grating off the zest before eating citrus. I like to throw orange peels in a pot of water on my woodstove, with some cinnamon and cloves mixed in, to sweeten the air. Sounds delightful! There really are so many uses for things that we might easily throw away.